At first blush, it sounds like the talk of a conspiracy theorist: a company implanting microchips in their employee’s right hand. But it’s not a conspiracy, at least not yet it isn’t, but it is a prophecy, and people are lining up for the opportunity to get the “MARK” of the future Global Government in their right hand. This is only the beginning my friend, the next big step will be the eradication of all cash. On Aug. 1, employees at Three Square Market, a technology company in Wisconsin, can choose to have a chip the size of a grain of rice injected between their thumb and index finger. Once that is done, any task involving RFID technology — swiping into the office building, paying for food in the cafeteria etc. — can be accomplished with a wave of the hand. The program is not yet mandatory, but as of this past Monday, more than 50 out of 80 employees at Three Square’s headquarters in River Falls, Wis., had volunteered. Jon Krusell, another software engineer, and Melissa Timmins, the company’s sales director, were more hesitant. Mr. Krusell, who said he was excited about the technology but leery of an implanted device, he might get a ring with a chip instead. The program — a partnership between Three Square Market and the Swedish company Biohax International — is believed to be the first of its kind in the United States, but it has already been done at a Swedish company, Epicenter. It raises a variety of questions, both privacy- and health-related. “Another potential problem,” Dr. Acquisti said, “is that technology designed for one purpose may later be used for another. 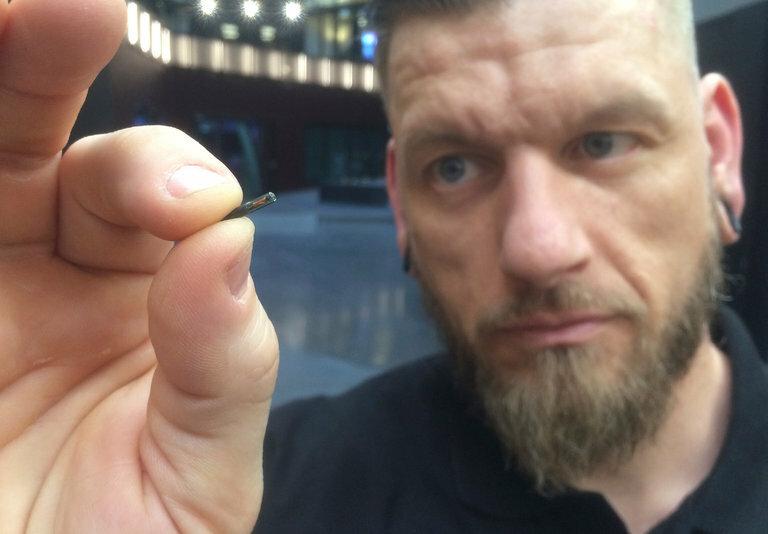 A microchip implanted today to allow for easy building access and payments could, in theory, be used later in more invasive ways: to track the length of employees’ bathroom or lunch breaks, for instance, without their consent or even their knowledge. Once they are implanted, it’s very hard to predict or stop a future widening of their usage,” Dr. Acquisti said. Health concerns are more difficult to assess. Implantable radio-frequency transponder systems, the technical name for the chips, were approved by the Food and Drug Administration in 2004 for medical uses. But in rare cases, according to the F.D.A., the implantation site may become infected, or the chip may migrate elsewhere in the body. Dewey Wahlin, general manager of Three Square, emphasized that the chips are F.D.A.-approved and removable. “I’m going to have it implanted in me, and I don’t see any concerns,” he said. THE BOTTOM LINE: You can bet you sweet bipi that the globalist are all over this like white on rice. Artificial intelligence, electronic implants, electronic money, all the records of who you are on a microchip, all wonderful things of progress that can be and will be used by a global government to make us all a dependent society. And that no man might buy or sell, save he that has the mark, or the name of the beast, or the number of his name. Part of the prophecy is the name of the Beast which is Satan, the antichrist of the one world government. Moreover like never before, we now live in a digital world. And the number of his name is 666. Do You Feel Safe From A Nuclear Attack? FBI: Thousands Of ISIS Threatens U.S.